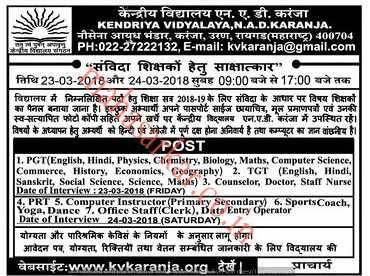 Kendriya Vidyalaya NAD Karanja (KV NAD Karanja), Published Job Notification for Staff Nurse – Sports Coach & Many More Posts. Candidates who wish to apply must look at Kendriya Vidyalaya NAD Karanja Staff Nurse – Sports Coach & Many More Recruitment 2018. Eligible candidates can join Walk-in Interview on 23-03-2018 & 24-03-2018. Kendriya Vidyalaya, Naval Station Karanja,, Taluka-Uran, Dist.-Raigad, State: Maharastra, Pin-400 704. Starting Date, Last Date to Apply Offline at KV NAD Karanja which candidates should be remembers as follows. Walk-in Interview on: 23-03-2018 & 24-03-2018.